On my fridge is a drawing by my son, Cooper, that serves as my morning inspiration. 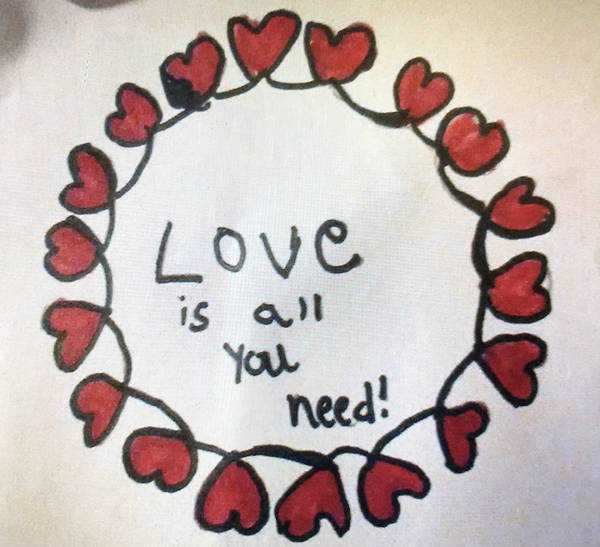 The artwork is a group of hearts forming a circle with a line of the classic "Beatles" tune, "All you need is love" written inside. Simple, yet profound, if you ponder it long enough. As Valentine's Day nears, Coop's art has my mind wondering, "what is love truly?". Is it tangible? Is it a feeling? Is it real? Is it necessary? When the "fab four" crooned their hit, they were touting the need for world peace amid the tumultuous 1960s Vietnam era. I interpret love as a vital element of human survival. When gathering resources for a child psych paper I was writing a few semesters ago, I came across an intriguing scientific study. The research proved that babies who were given basic nutritional care, proper clothing, shelter and healthcare, but were denied any nurturing or love, survived, but failed to thrive. Without loving care, human brains, thought process and personalities are stunted; losing their abilities to give and receive love. I suppose the "mop tops" were onto something when they wrote that song. Anyone raising a teen today, knows good conversation and expressions of love can be few and far between, as their faces are generally tethered to an electronic device. I believe teens face the same outcome as the babies who were denied love in that study I wrote about, if measures are not taken. Young people of today are losing social and interpersonal skills at an alarming rate because their sole existence seems to be in cyber world. Just take a look around the next time you're at a restaurant. No longer is an eating establishment a din of chatter and conversation like in prior years, it is merely a blue-light special of heads bowed, not in prayer, but engulfed in what's on the user devices. Call me old fashioned, but I've always taken the approach with Cooper that there's more to life than what's on your electronics. He's grown up with a landline phone, VCR and mowing with a reel lawn mower (the kind that uses muscle instead of gas). He has a well rounded view of all things old and modern. He appreciates and treasures the world of yesterday and today. Plus, it's been a way for me to keep the spirit of his grandparents and great-grandparents alive and well, impacting his life in a positive, useful way. Once in awhile, I like to throw in a few teen angst movies from the 1980s, like The Breakfast Club, to drive home what it was like for me growing up as a teen pre internet and cell phones. These films show similarities between teens of yesterday and today, sharing and facing many of the same issues and challenges. He enjoys our classic movie viewing. But little does Coop know, I'm bestowing some life lessons on him simultaneously. Moms and dads, you gotta seize the parenting moments any way you can! I suppose all you really do need to survive this life is love; and maybe throw in an 80s movie for good measure.